Necrotic tissue has an associated “Necrotic burden” which includes exudates and high levels of bacteria1. These bacteria limit pro-wound healing molecules which may lead the delayed wound closure 2. Creating a wound treatment pathway often demands that we establish multiple goals when faced with the common scenario of reducing necrotic tissue and the risk for infection. We have chosen, therefore, to evaluate a broad-spectrum antimicrobial hydrogel that also exhibits pronounced autolytic debridement properties 3. 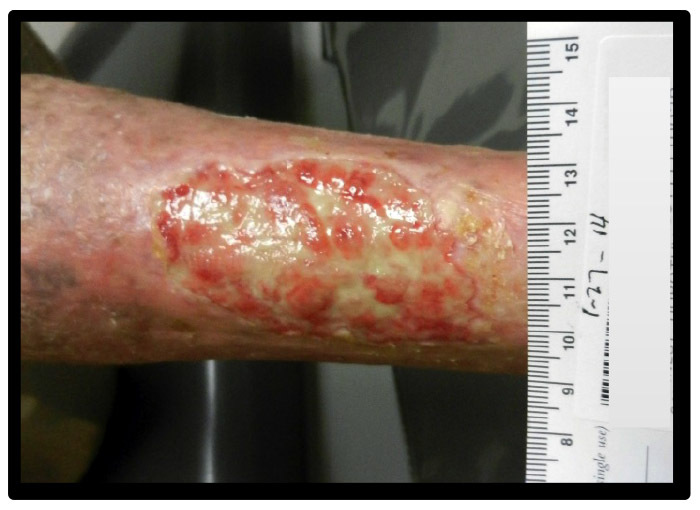 Patient 7 – Received radiation for squamous cell carcinoma of the right anterior leg. The tissue at this site gradually broke down into a wound with significant amounts of slough. The first goal of the clinician was to remove the tenacious thick slough layered over the wound. Sodium Hypochlorite Antimicrobial Gel was placed daily from 1/6/14 to the 1/27/14. At this point the authors observed a 40% reduction in slough and several islands of healing over the irradiated wound bed. A eight patient case series was conducted. Each of the patients enrolled in the study were significant for moderate to high amounts of adherent necrotic wound tissue with an average starting necrotic tissue percentage of 73% (adherent slough is defined as slough content that cannot be removed from the wound bed with a gauze cleaning). Sodium Hypochlorite Antimicrobial Gel* was applied to the necrotic wound tissue daily and covered with a secondary dressing. Use of sharps debridement, non-contact ultrasound systems, contact ultrasound systems, contact hydro-surgery systems and other forms of debridement was not employed during the evaluation of this product. Dressing applications consisted of 1-3 day applications of the gel with or without compression. Data on both the wound progress towards closure as well as the reduction of avascular tissue was gathered for the evaluation of the autolytic debridement gel. In this eight patient case series we found that the Sodium Hypochlorite Antimicrobial Gel was suitable for use in debriding wounds. 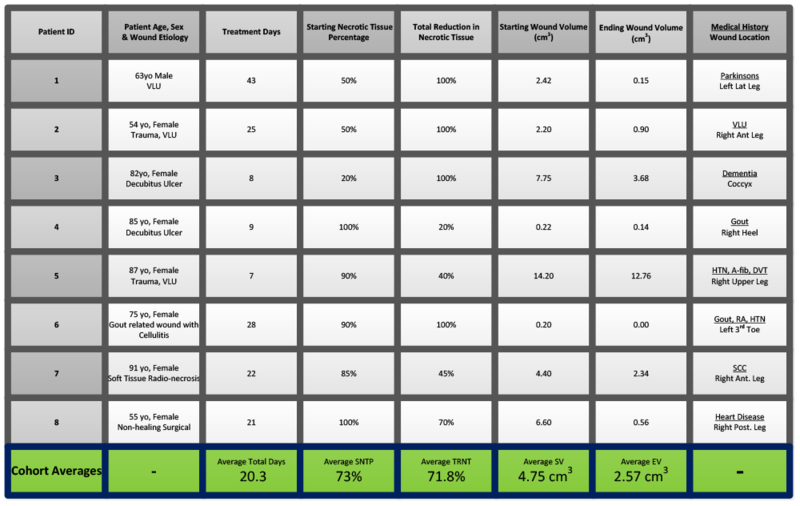 With a cohort that averaged an initial amount of 73% necrotic tissue on the wound bed we observed a 71.8% reduction in necrotic tissue in an average of 20.3 days. Moreover, we measured a 46% reduction in wound volume over the 20.3 days indicating the gel studied provides a pro-wound healing environment. Clinicians need options for debridement in their wound management tool kit. Combined variables such as necrotic tissue and infection limit a clinician’s selection to other slower autolytic debridement options4. 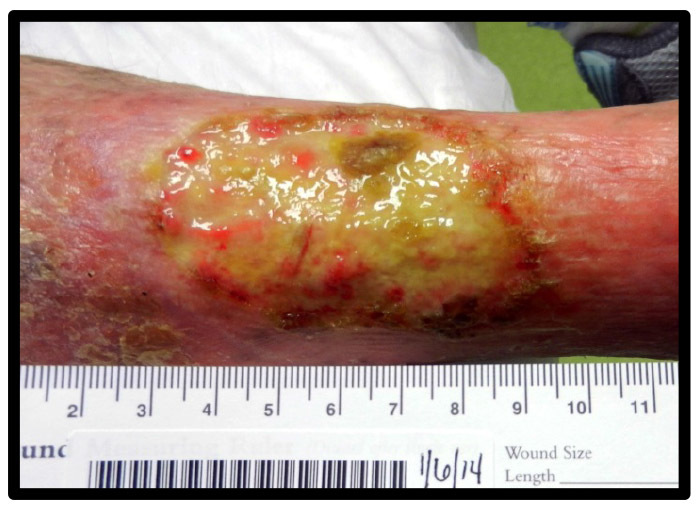 Results of this case series suggest that the Sodium Hypochlorite Antimicrobial Gel tested provides a unique treatment for this dual condition, as the product was successful in reducing necrotic tissue from the wound bed. Ample evidence also supports the use this gel as a rapid broad spectrum bactericidal, including the treatment of antibiotic resistant strains MRSA & VRE 5. This study provided the authors with an understanding of the benefits of Sodium Hypochlorite Antimicrobial Gel as an autolytic debridement agent. We had tracked another wound, but it was excluded (related to its small size and rapid improvement) as it significantly skewed the data in favor of the studied product. The authors noted no adverse effects related to the studied product. The authors recommend larger patient studies, informed by the debridement rates obtained in this pilot study, to corroborate the positive clinical results observed in the cohort studied. 2. Baharestani M. The clinical relevance of debridement. In: Baharestani M, Gottrup F, Holstein P, Vanscheidt W (eds). The Clinical Relevance of Debridement. Heidelberg: Springer-Verlag, 1999. 3. Bowler, P., Duerdenand, B., & Armstrong, D., 2001. Wound Microbiology and Associated Approaches to Wound Management. Clin Microbiol Rev. 2001 April; 14(2): 244–269. 4. Livingston, M., & Wolvos, T., 2009. Scottsdale Wound Management Guide. 1st Edition HMP Communications, Philadelphia, PA.
* Anasept® Antimicrobial Skin & Wound Gel , Anacapa Technologies, Inc.